The Strata Ultimate club set is built with modernized golf technology for ultimate distance, performance and forgiveness. Expect longer shots with ease and more control to inspire confidence in your game at an incredible value. The set features a full titanium driver with a large sweet spot for more forgiveness, a very forgiving 3-wood built for long, high flying shots with an aerodynamic head shape and hybrids that allow you to play with more confidence on a variety of shots. The stainless steel irons feature high flight technology to deliver distance, forgiveness, and control while the putter is designed for better accuracy and distance control to help you sink more putts. 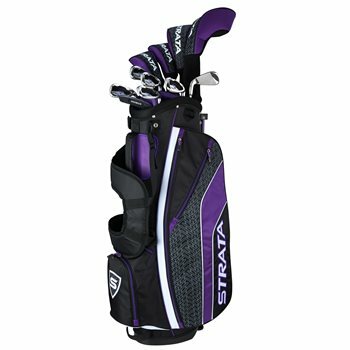 The lightweight, durable stand bag combines a cool authentic look, convenient pockets, tee holders and an easy to carry back strap.